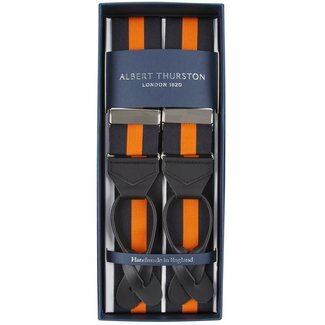 Albert Thurston braces white moiré with brass clips, worn b..
Albert Thurston braces black with an orange stripe. 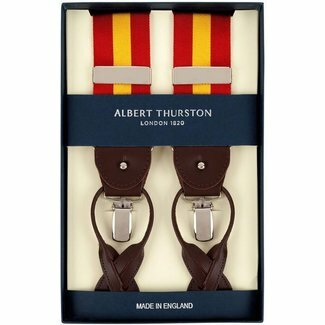 This mo..
Albert Thurston braces red with a yellow stripe. This model.. 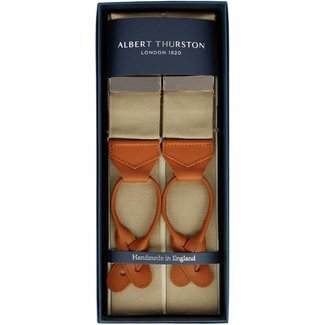 Beige with navy striped braces made by Albert Thurston. 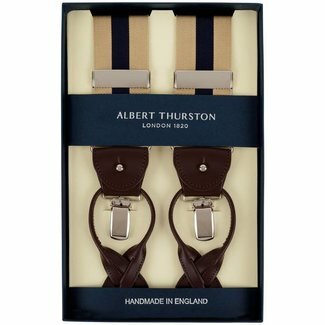 Atta..
Albert Thurston striped braces for men in the colors blue an..
Albert Thurston striped braces for men in the colors burgund..
Khaki brown braces for men finished with light brown leather..
Albert Thurston braces with burgundy and navy stripes. 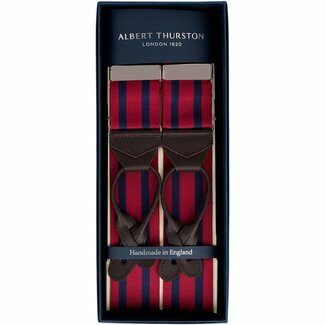 This..
Albert Thurston braces with navy and burgundy stripes. This.. 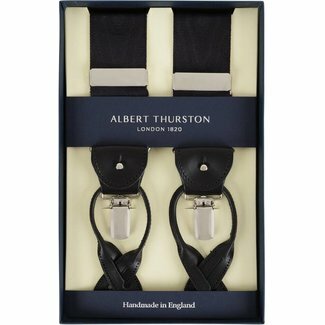 Dark grey braces for men finished with black leather. 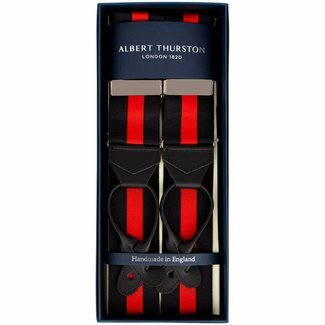 These..
Albert Thurston braces black with a red stripe. 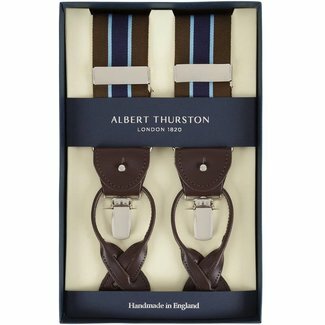 This model ..
Albert Thurston mens braces royal blue with black leather st..
Albert Thurston men's braces in almond brown. 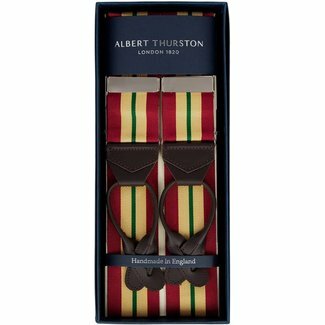 This model ha..
Albert Thurston braces navy with a silver stripe in the midd..
Albert Thurston braces green with a black stripe. 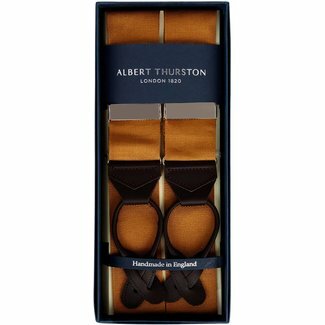 This mode..
Albert Thurston braces green finished with brown leather. Yo.. 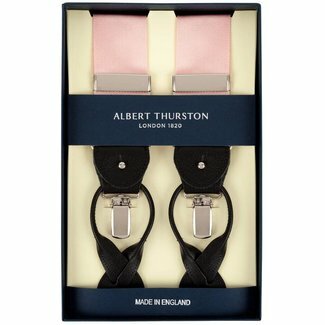 Pink braces from Albert Thurston finished with black leather..
Albert Thurston braces purple finished with black leather. 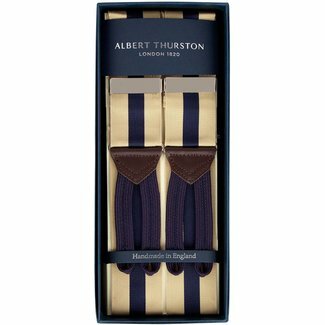 Y..
Albert Thurston braces beige with a blue stripe. 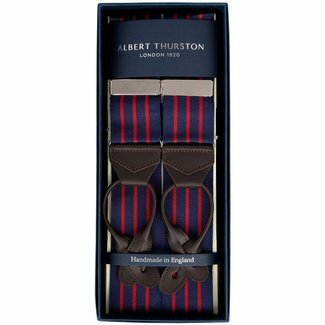 This model..
Albert Thurston braces navy with a red stripe. 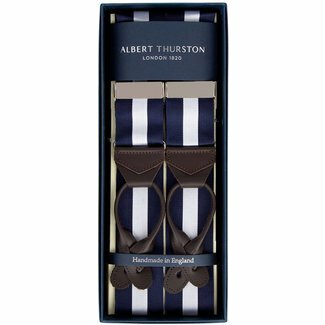 This model h..
Albert Thurston braces navy with navy French lilies and stit..
Albert Thurston braces with stripes in brown, blue and light..
Albert Thurston braces black moiré with a Y-shaped back and..
Albert Thurston braces beige with a green stripe. This mode.. 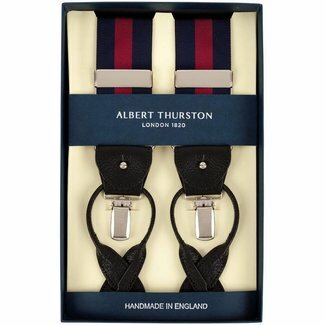 Braces, also known as suspenders, are permanent accessories in men's fashion. The accessory has a long history dating back to 1700. At that time, it was mainly a practical tool to keep the pants up. Now it is a functional fashion item. The quality of braces contributes to the wearing comfort. 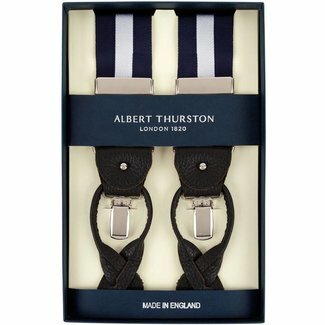 Luxury braces have a good fit, sturdy stellers and sturdy clips or loops for buttons. 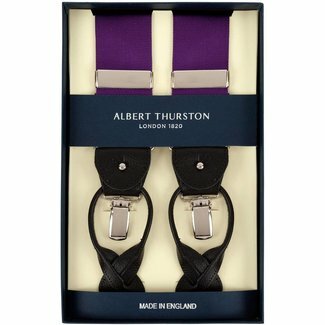 At Quality Shop, you buy quality braces from, among others, the English brand Albert Thurston. The brand has been making braces in the traditional way since 1820. 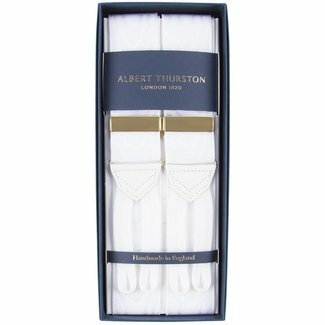 If you have a good pair of braces from Albert Thurston, you will be sure to enjoy them. 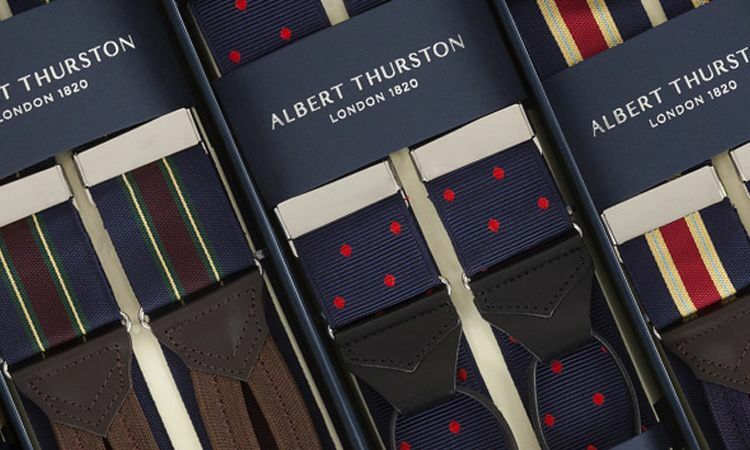 You not only give your outfit an extra touch, it also works well functionally. According to etiquette, you should not wear braces visibly, but under a jacket. Yet, nowadays it is an accessory that can be shown. It is very fashion-conscious to wear your braces visibly. 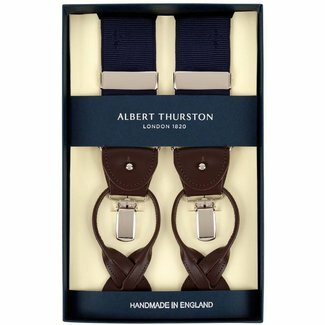 A rule that you absolutely must not exceed, is wearing a belt and braces at the same time. 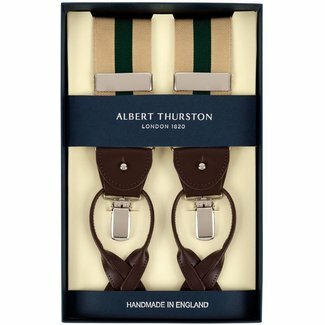 braces have the same function as a belt, so you have to make a choice between these two accessories. At Quality Shop, you can choose from two types of men's braces. You can choose between braces with loops or braces with clips and loops, the so-called 2 in 1 braces. There are different ways to attach the braces to your pants. 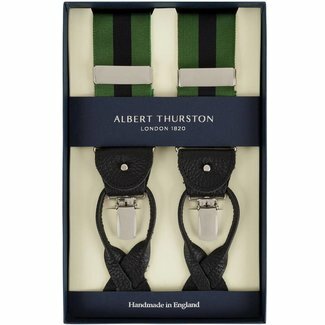 The variant with loops is attached with buttons to your waistband. 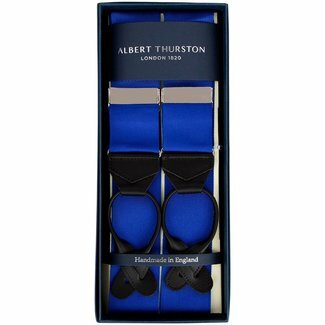 All braces are supplied with buttons, these can be sewn on the inside of your waistband. With the 2 in 1 variant, you can choose whether you attach it to your waistband with clips or use the loops with buttons, the loops and clips are easy to remove. 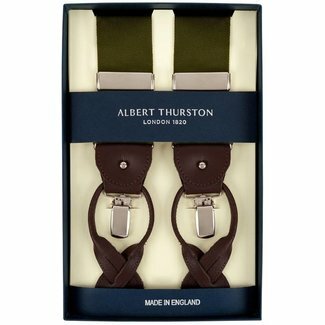 If you like to use the braces with buttonholes but do not want to sew buttons on the inside of the waistband, you can use clip-on buttons. These are braces buttons that you attach to the waistband, then you can attach the loops to them. 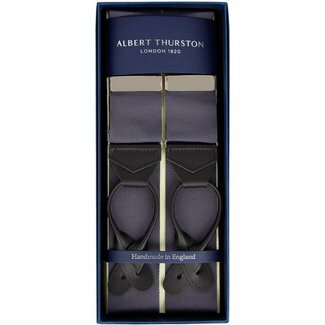 An advantage of clip-on buttons is that you do not have to attach buttons to every waistband.